How would you like a perfect frosting for cookies? I mean perfect. What is needed is a cookie frosting that will firm up, so it cannot be crushed. But it must not harden so that it cracks or is resistant to the bite. Firmness and softness must be achieved in the same frosting. This recipe does just that. The secret is to use evaporated milk, and melted butter, as the liquid base. Then gradually add powdered sugar to achieve the spreading consistency you need. I was a bit curious doing this the first time. Evaporated milk? What as that going to do for me that regular milk or heavy cream would not? You’ll be oh so pleasantly surprised. This frosting develops a “body” that is thick and yet not too sticky for easy application. When first made, it has this deep consistency yet can be applied to cookies quite readily. Quite thickly, I should add, as the picture above shows you. Then, you just wait an hour, and the frosting has firmed up so that the cookies can be easily moved, stacked and stored. Yet, when you bite a cookie, the frosting softly surrenders to your teeth and you encounter no untoward resistance. How did I respond to this? I went to the store and bought a supply of 4 ounce evaporated milk cans. I’m going to use this over and over. 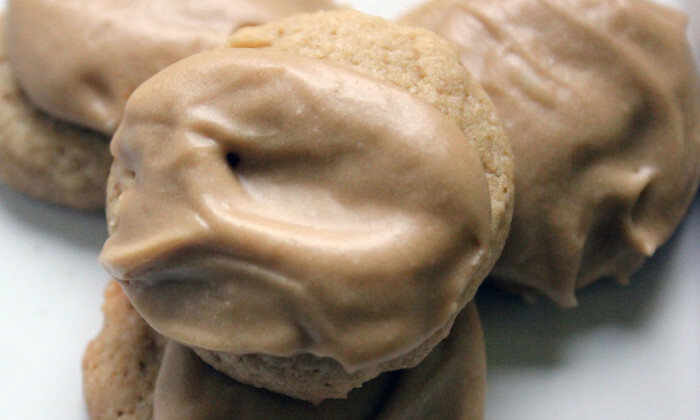 The maple version can go on a variety of cookies, including blondies and shortbread. Take away the maple flavoring and add just a little cocoa powder or melted chocolate to have an exceptional chocolate topping. Imagine a chocolate chip cookie with the perfect frosting? You’ll find the evaporated milk most likely in the baking aisle of your supermarket. I’ll see you there. In a medium bowl stir together evaporated milk, melted butter, and maple flavoring. Gradually stir in enough of the powdered sugar to reach spreading consistency. Spread tops of the cookies with icing. Yes, but I would not do it with the frosting. Frost fresh.